Spending a fortune on a mini interior makeover these days is a definite no-no. 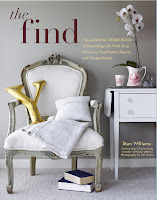 So when Allison Hemming, the Big Gun at The Hired Guns called on me to glam up her personal office space in her business's glamourous new digs with less than $130, I put on my lucky thrifting cap and called upon my pal, decorator Mark Ciolli of Carl and Co. to help me assess the situation. I had less than 24 hours to pull the whole thing together, so a call to Mark was No. 1 on my list. When we got there, her office was void of personality yet filled with stuff. A cheap, rickety bookshelf sat on one wall and had to stay there since the new cabinet it'll replace hadn't arrived yet. "Get a whole bunch of bodega candles, organize those shelves and be sure to leave empty space for balance," Mark quipped. "And then a tree in the corner....that'll make all the difference." Thankfully, I didn't have to run out and buy the tree, which sits happily in the corner. Instead, Allison tapped into one of her in-house floral connections. But I got the candles ($40) easy enough and lined them across the cabinet, but it still looked naked. So off to Housing Works next door I jetted to see what I might spy on display. There in the corner were three framed prints ($50 for all) that looked like they had been curated just for me. Since Allison's office could be a reality show in itself, the needlepoint Greek theatre masks seemed appropriate, especially when paired with an African print that mimicked the same shape and color story. miniature lamp I have had for years, a stack of old cigarette paper rolls that I salvaged from a closed-down paper plant in Rijeka, Croatia, a pair of Versace pillows I picked up one year at the Milan runway, and a funny set of books on world religions that I found at an LA garage sale. The piece de resistance was something Allison already owned: a set of Star Trek plates that she was determined to display prominently on her wall. As her associate, Mr. Perkins and I scurried around to get everything in order, Allison announced that we had 45 minutes until the guest arrived. The jet set plates (right) now hover above the two chairs and table (above), adding a dash of intergallactic elegance to Allison's office. Take a look at the alluring work of these home decor lovebirds, Senor Amor and Jonona of Jonamor Décor, in yesterday's Los Angeles Times! As I was touring LA last week with my two fabulous design pals they gave me a sneak peak of performer Jackie Beat's home where I witnessed with my own two eyes the Carrie office that Senor and Jonona created. It was dramatic, yet professional. And even though the idea is kitschy, the execution is clean and functional, making use of collected wall arrangments and a unified color scheme. On the same day, we stopped by Nick Metropolis on La Brea to pick up a sofa for one of their music producer clients. Nick's is a thrift-o-ramaof everything from mid-century sofas and dinettes to odd display items (get a load of the gigantic martini glass) and whimsical accessories. Senor and Jonona have a special gift for cleverly incorporating vintage and thrift purchases into brand-new design projects. And even though they are skilled at casting the right colors, picking the perfect wallpaper and crafting the perfect window treatments, they continue to give to give new life to other people's castoffs. 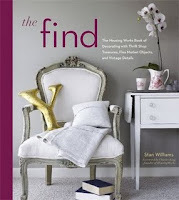 In May, you can see Senor and Jonona's work featured in my book, The Find, The Housing Works Book of Decorating with Thrift Shop Treasures, Flea Market Objects, and Vintage Details (Clarkson Potter). Pre-order now on Amazon, Barnes & Noble and Borders.